This is mainly the story of John D. Bassett III (JBIII), J.D. 's grandson, and his battle to keep his factory alive, his employees working, and American-made furniture in American homes. Macy makes JBIII, his ancestors, and his cousins and in-laws rich and compelling characters. The growth of the Bassett companies, the cooperation and conflict within the family, and the close intertwining among the family, the industry, and the communities they operate in is revealed in beautiful and absorbing detail. When JBIII recognizes the impact Chinese imports are having not just on his business but on the whole industry, he decides to fight back. Because Vaughn-Bassett is closely held, unlike many other furniture companies, even the original Bassett Furniture, he's free to pursue what he thinks is the best course, and not just the quarterly bottom line. 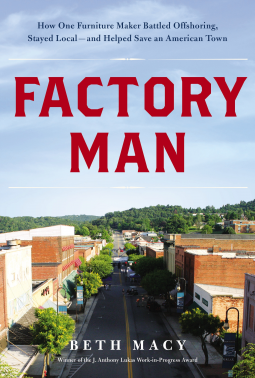 He uses the tools provided by the same laws that enabled the foreign threat to his business to fight back, and keep his factory and his town alive. Macy brings the story to life, clearly explaining the business issues, the economic issues, and the personalities at play here. She and Bassett ask a question often overlooked in the free market purists' enthusiasm for low consumer prices: What good are low prices if the would-be consumers don't have jobs, or are making so little that they can't afford even those "low" prices?